Would you paint your bicycle using enamel house paint and a brush? Today bicycle frame painters will finish the top coat of colour on your bike frame using spray equipment, and a high quality automotive paint from a paint supplier like Spies Hecker. 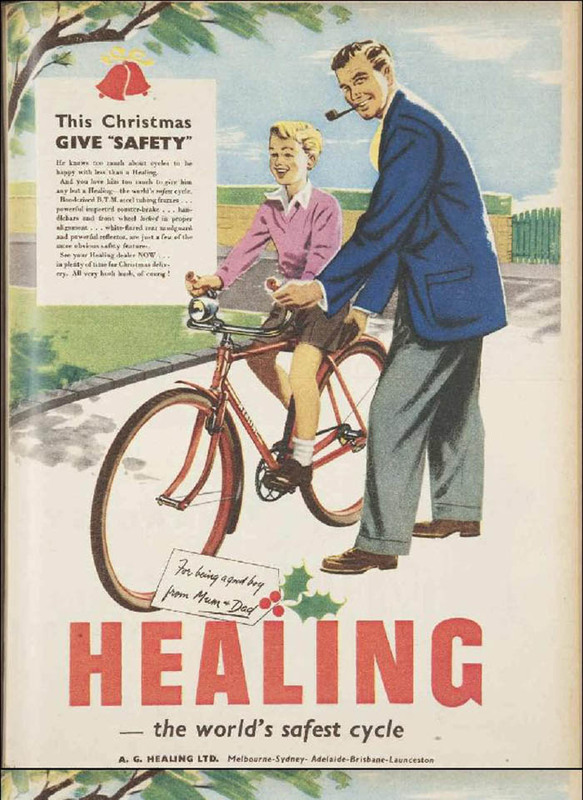 Back in the 1950’s you could walk into an Australian bicycle shop and choose a 2 1/2 fluid ounce tin of enamel paint from Berger, British Paints or Dulux, then simply brush on a new enamel colour. This DIY bicycle painting approach may seem strange today, yet back in the middle of the twentieth century the mindset of bicycle owners was shaped by other influences. Old bicycles could be “restored” at home and given a new lease of life. Factory bicycle painting equipment, for example an enamelling oven, was out of reach and highly impracticable for the average bicycle enthusiast or a father wanting his kids to ride a bicycle for the first time. Original factory paint finishes were most commonly oven baked enamel, this practice began in the late 19th Century and some frame painters will still offer oven baked enamel finishes today. 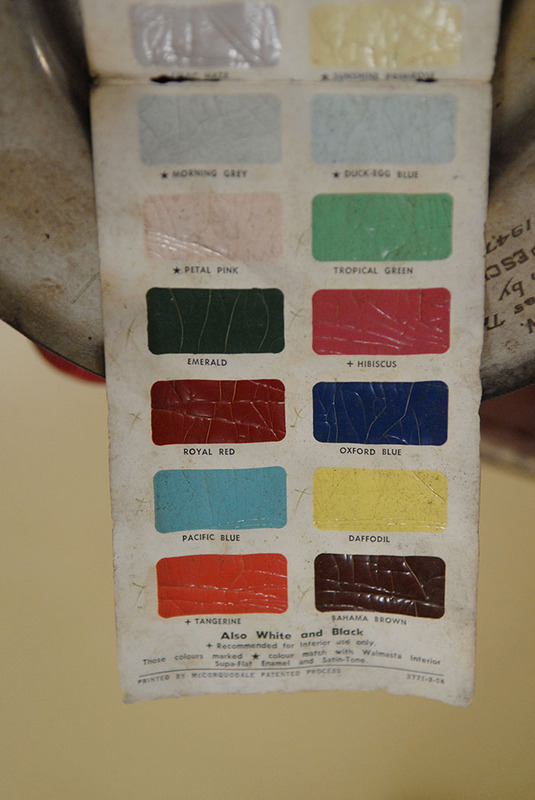 Rocket Cycles Petrie terrace, the British Paints colour chart, in service for nearly fifty years. W. Blows and Son had a bike shop at Broken Hill. In 1898 when a customer brought in a bike for re-painting Blows and Son described the aged appearance of the bike as “a machine which had begun to show the mangy-looking spottiness of old age or too careless handling had to be sent to Adelaide for re-enamelling.” ¹ No matter where you were, oven enamelling was a standard finish for bicycles. W. Blows had to send their bikes away to be competently, oven enamelled. Later Blows and Son bought their own enamelling oven. Re-painting old bicycles using enamel house paints was the closest thing that the home handyman was ever going to get to approximate a factory enamel, oven paint finish. After World War Two some Australian families simply couldn’t afford to buy new bicycles. A reconditioned bike was a great option. These hand-me-down bikes circulated around the suburbs and country towns of Australia for decades. I remember some of these old bikes in the 1970’s, they’d already seen years of use with worn pedals and chains, rusty handlebars and wrinkled rhino hide like leather saddles. Repairing them meant loosing some skin off your knuckles, trying to bash, shape and wedge cotter pins into cranks that just wouldn’t budge. A typical bike that would have been a candidate for Jack Pesch's Rocket Cycles paints. Advertising from Dulux in the 1950’s listed the many household uses for their enamel paint. 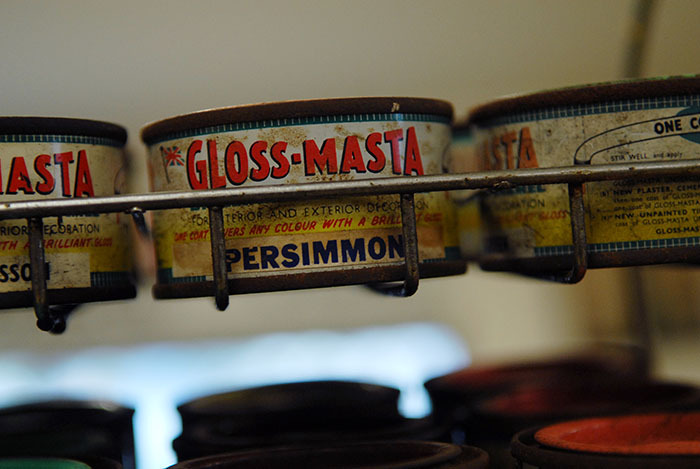 The Dulux list for Super-Enamel included “Odd jobs on the family car, bicycles, picture frames, screen doors, skirting boards and architraves, boats and many more.” Dulux paints came in “tiny tins” for convenience and a low price. Over the weekend I tagged along with a group of intrepid Brisbane bike aficionado’s, for a drive up the coast to visit a bike collector. Part of this collection includes the contents of the showroom and old workshop of Rocket Cycles, formerly located at Petrie Terrace Brisbane. Jack Pesch was the owner of Rocket Cycles and is well known as a local Brisbane cycling identity. Part of the counter display from Rocket Cycles includes the rack of British Paints that were still for sale less than twenty years ago and dating from the late 1950’s. I found a 1958 advertisement for these same British Paints. Included with the paint tin display is the original paint chart that Jack would have used to show the colour range. The current curator and owner of the Jack Pesch cycling collection remarked that the colours that we see left in the rack, are the ugly colours that no one wanted back in the 1950’s and 60’s. British Paints Gloss Masta Brilliant Gloss Enamel colours came in 24 colours. Bahama Brown, a mission brown that would have looked great on old fashioned skirting boards and was a popular colour in Queensland. Tangerine, a bright orange that was popularised when the Malvern star dragster hit Australian streets. Emerald would have looked the part in a darkened 19th Century Queensland cottage kitchen. Tropical green was typically used on the soffit of Queensland verandah rooves. I think you get the picture by now, take a look at the paint chart below and you’ll see why it was well suited to painting a traditional Queensland house. One of the attributes of British Paints Gloss Masta was that it could conveniently cover old paint with one coat, making it a cheap option for bicycle painting. Jack Pesch's well worn bike paint catalogue gives us a view into the mindset of a different era. When Jack's boxes of bike shop ephemera were unpacked by the current custodian, there were boxes filled with old brake pads. Pads that were worn out and replaced in the rocket Cycles workshop. Jack didn't throw anything out. For some Australian's the 1930's depression era and World War Two hardships transferred into life long patterns of sparing everything in case it was required later. The old saying "Waste Not Want Not" rings true here. Once I was travelling with an elderly family member, we stopped for a cup of tea and she saved a small tin foil pie dish, cleaning it at the table and putting it in her hand bag. Months later when we visited her home, the pie dish was still being used to place tea bags onto after use. The same tea bags being re-used. These paints serve as a reminder that not long ago bicycles were recycled and reused, for many years more than their modern counterparts. One of these tins of paint could put a smile on the face of a kid at Christmas, worth way more than the small price paid for a shiny new colour. 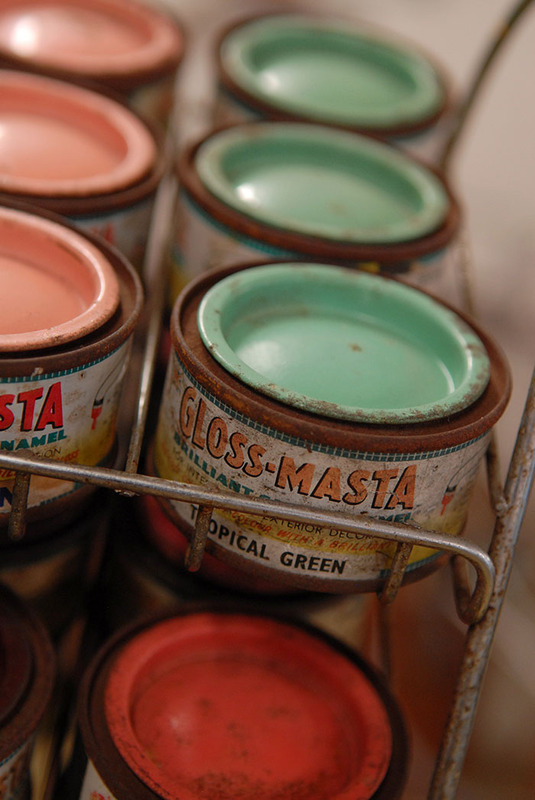 British Paints Gloss Masta was meant for skirting boards and architraves in houses, not produced for bicycles. Despite it's intended use for house painting, full gloss enamel paints were sold for re-painting bicycles. The attraction here, one small tin of paint wa cheap and it could coat an entire bike frame if applied with care. Jack Pesch's Rocket Cycles paint chart for old bicycles. One coat covers all old paint. Jack Pesch's Rocket cycles paint tin rack for re-painting old bikes. 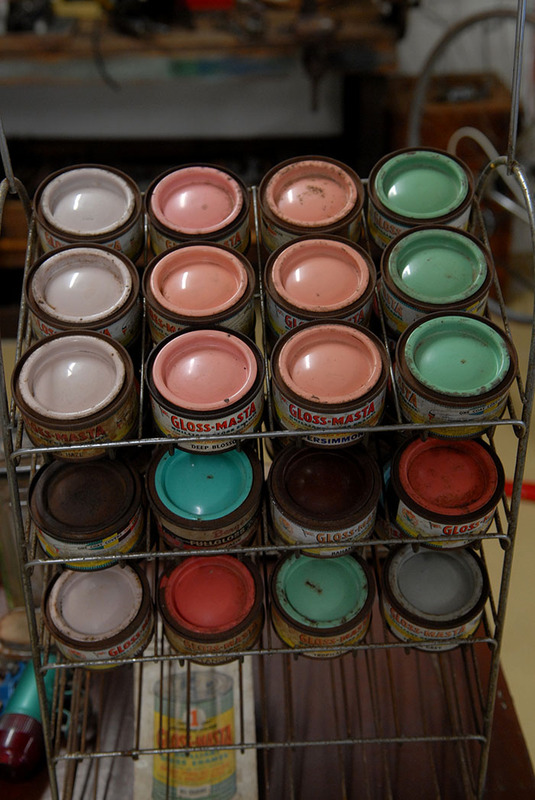 These old bike paint colours that were meant for houses are some of the colours that sat on the rack for decades. Obviously not the most popular colour back in the 1950's. The green looks conspicuously like Bianchi celeste. British Paints tropical green and tudor grey for bicycles, the verandah soffit and architraves. Bahama brown, more suited to skirting boards and tangerine which became a popular colour on Malvern Star dragster bicycles a few years on. Berger paints Jade for bikes. Looks like another one for traditional Queensland house doors and verandah soffits or Bianchi bicycles. Lilac haze bike and house paint. Another bike paint colour popular on Bianchi's but not at Jack's Rocket Cycles shop. Jack Pesch's well worn Rocket Cycles paint chart for bicycles, houses, automobiles and anything else you can think of.